Miatta Momoh, Kente & Silk’s co-founder, who works as its Business Development Manager. Africa-China Tech for Social Impact (ACT-SI) is set to strengthen Africa’s technology through partnership with China by exploring how Africans are using technology to create social solutions, at the same time, seeking opportunities for Chinese collaboration and investment in African technology. ACT-SI is a project initiated by Kente & Silk, a social enterprise which was co-founded by Miatta Momoh, a Sierra Leonean who works as its Business Development Manager. On 22nd November, ACT-SI organised event brought together over 80 passionate entrepreneurs and professionals who are keen to learn about Africa’s technological scene and opportunities for partnership. The event was ACT-SI’s first series held at Innoway, an incubator located in China’s hub for tech innovation in Zhongguancun, Beijing. It was co-hosted by Kente & Silk and Startup Grind. Sharing her thoughts as guest speaker on how Africa, a continent with the world’s youngest population, is producing technological innovations and trends to look out for, Lina Getachew Ayenew, founder of Education for Ethiopia (E4E), said she has dedicated herself to leverage technology in order to improve education in Ethiopia. She recalled how access to information and people changed her family’s life and eventually paved her way to Yale University, United States’ third oldest institution of higher education. 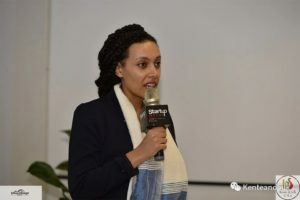 “E4E is a digital education platform which creates educational content in partnership with the best teachers in Ethiopia and digitally offers locally tailored materials,” she said. Hannah Wanjie Ryder, founder of Development Reimagined (DR), said her enterprise is a consulting firm which provides innovative solutions to challenging development issues. The DR founder, who provided an overall picture of tech-innovation in different parts of Africa, explained how the Chinese are helping Africa’s innovation, including a new digital opportunities that the continent’s infrastructural, educational, and logistical gaps present. After the above two thoughts were shared, a heated discussions among the attendees ensued. They claimed that some local tech-innovation initiatives in Africa are going bankrupt while big Chinese companies are eating up market shares. An Ethiopian academic, Abdella, who is currently sponsoring 35 school-going children in Ethiopia, stated that he was the only one from his village that was able to acquire tertiary education. He urged the attendees to prioritise innovative solutions amidst a range of potential opportunities and challenges. 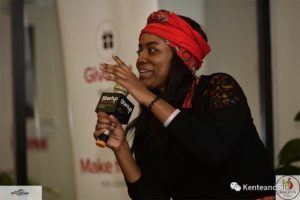 Giving her impression, Miatta Momoh said she was excited to see such a diverse crowd of young entrepreneurs, corporate and academics, who are enthusiastic about the opportunities of African technology. She noted that for future ACT-SI events, they hope to get Sierra Leone’s Chief Innovation Officer (CIO), Dr. David Sengeh, as keynote speaker.